manila fashion observer: Tresorie Sale! 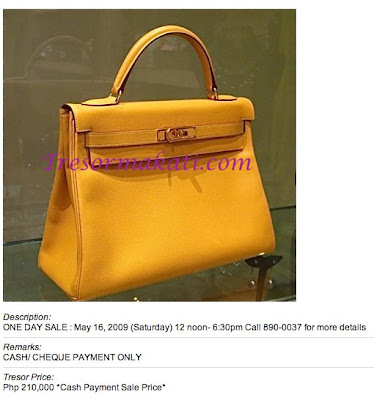 Amazing bags to choose from - take your pick form Hermes, Goyard, Chanel, Balenciaga, etc! Click here to see what's in store! I spy a classic Chanel 2.55 for Php 55,000, Goyards for around Php 30,000 and a Kelly for Php 210,000! Eeep! Tempting! Call 890-0037 for more details! i saw that yellow bag and it was L-O-V-E-L-Y.